The Concetto Professional kitchen tap ... incredibly flexible. Every year, the awards recognise visionary buildings, innovative products, and sustainable communication in the sectors of architecture, construction, industry and production industry. Grohe’s Blue Home tap water system, the professional Concetto Professional kitchen tap and the Euphoria 260 shower head each received a ‘Best of Best’ Iconic Award 2017 in the Product category. Blue Home delivers filtered water chilled to the perfect drinking temperature in three options: sparkling, lightly sparkling or still, directly into your glass at a touch of a button. The system, which combines timeless design with innovative technology, consists of an elegant kitchen tap and a high-performance cooler with integrated filter. Euphoria 260 shower head ... soothing showering. With its GrohFlexx and EasyDock M technology, the Concetto Professional kitchen tap is incredibly flexible and easy to use. 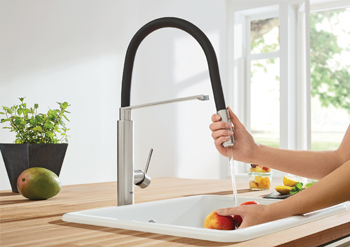 The tap has a silicone hose with an integrated metal spring, allowing it to turn 360 degrees, and a button for easily switching between normal water flow and jet spray – perfect for washing dishes, rinsing vegetables and filling tall pots effortlessly. 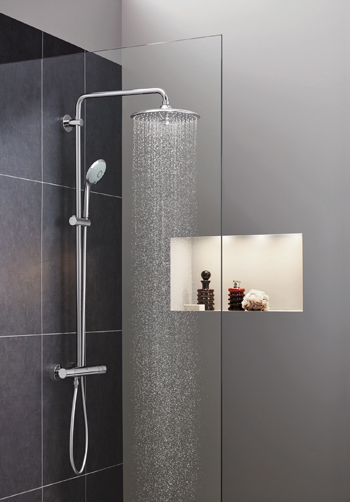 Meanwhile, the Euphoria 260 shower head transforms showering into a soothing and custom-made experience with its 260-mm diameter and three zone features using the SmartControl panel. Also in the Product category, Grohe received awards for the Lineare and Essence Professional tap collections as well as for the concealed control element SmartControl Concealed and Grohe Sense and Grohe Sense Guard, the new water security system. In the Architecture category, Grohe won an award for its impressive booth at the ISH 2017 trade fair in Frankfurt. With the slogan “water. Intelligence. Enjoyment”, Grohe presented itself as a pioneering market leader in the sector and showcased the digital controllability of water as an innovation in its own spectacular exhibition hall. Lastly, Grohe was awarded in the Communication category for its publication series Grohe Architekturlösungen, a supplement of the German construction magazine DBZ Deutsche BauZeitschrift. The publication is one of the company’s central communication tools and its target audience consists of architects, professional planners, plumbing experts and theme-specific groups. Grohe, a global leader in sanitary fittings and a global brand dedicated to providing innovative water products, is part of the Japanese Lixil Corporation. Lixil itself is a global market leader in the sanitary ware industry, managing a broad portfolio of well-known household brands such as Grohe, American Standard, and Inax.